GopherCentral Library: Do you own a laptop? to help reduce heat from the internal system. 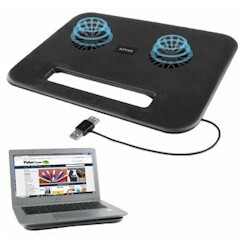 This Dual Laptop Cooling Pad is currently on clearance for under $4.00, and it has nothing but great reviews on the site. No batteries are need for this cooling pad, it powers through the laptops USB port! Easy to use, lightweight, and slim! Perfect to take anywhere with you on the go. Hurry, and stock up on this - these won't last, and at this price it's hard to pass up! Grab your Dual Laptop Cooling Pad Today! Better Quality, Better Price - Go TRULY Wireless with your earbuds! I haven’t tried this little trick just yet, but I love the idea! Your stick of butter has to be close to frozen for it to work, and you must work fast to keep it from melting, but the grated butter is perfect for adding to flour before baking biscuits, scones, muffins, etc.. It also makes the butter melt much faster, so if your butter is too cold to spread, consider grating it first and then topping toast, veggies, or a baked potato! Here's the trick: when making meatloaf, sausage, or meatballs, take a small chunk of your mixture and fry it in a skillet (or even faster, microwave it for 10 to 15 seconds) and taste. Adjust seasoning levels in the mixture accordingly. Instead of answering the obligatory question, "Plastic or paper?" why not invest in some reusable canvas bags? The key to this, I've found, is keeping the bags in your car. Once you've unpacked your groceries, leave the empty bags by your front door and the next time you go to your car, take them with you. Even if you opt for the plastic or paper grocery bags, you can still bring them with you on your next trip for reuse.